Bulgogi is a classic Korean dish that calls for grilling thin, marinated slices of beef. It's often stir-fried in a skillet when made at home. 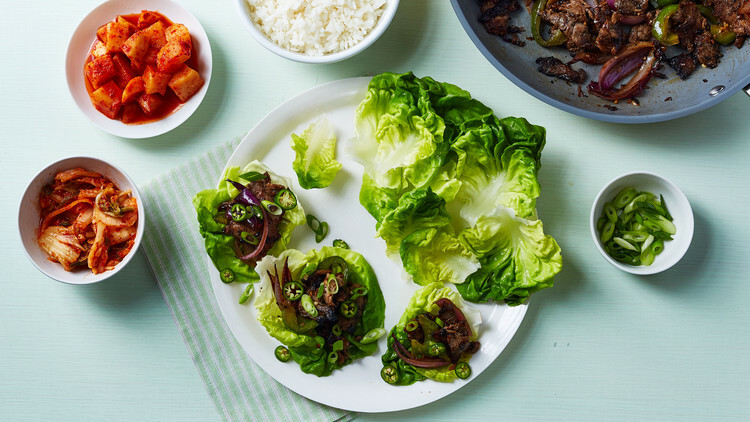 Serve with lettuce, rice, kimchi, thinly sliced scallions and jalapeno or serrano chiles, and ssamjang (Korean seasoned soybean paste), and let your guests assemble their own wraps. 1. Freeze beef 20 minutes; transfer to a clean work surface. Slice diagonally (across the grain) into 1/8-inch-thick strips. In a small bowl, whisk together soy sauce, sesame oil, brown sugar, garlic, and ginger. Place onions and peppers in a small bowl; toss with half the soy marinade. Toss steak in remaining marinade; let stand 15 minutes. 2. Heat 2 teaspoons vegetable oil in a large nonstick skillet over medium-high heat. Add onions and peppers; cook until softened, about 5 minutes. Transfer to a plate. Wipe skillet clean with a paper towel. 3. Heat remaining 2 teaspoons vegetable oil over high heat. Cook half the meat, turning often, until browned, about 2 minutes. Transfer to a plate. Cook remaining meat. Return first batch and any accumulated juices to pan; add onion mixture. Cook, tossing, until heated through, about 1 minute. 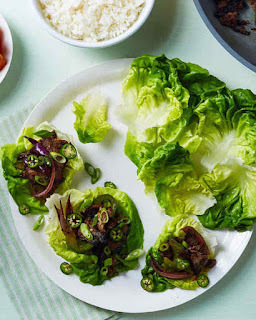 To serve, roll up beef mixture in lettuce leaves. If you can't find hot chili sesame oil, add a dash of gochugaru (Korean hot red-pepper powder) or crushed red-pepper flakes to 1 tablespoon toasted sesame oil.